Pesto alla Genovese by Casa Lombardi just flew in, travelling first class. It deserves all this attention because it is different than any other pesto sauce you can find in the market. As it is fresh, it needs to be kept refrigerated. The Lombardi family only uses the best ingredients: [reading the label] EV Olive Oil, parmigiano aged longer than 36 months, pecorino romano DOP, pinenuts from the pine forest of San Rossore, a natural reserve, and the famous basil from Pra (DOP genovese), the village near Genova where pesto sauce was invented. Recipe: bring the pesto to room temperature, cook pasta (better trenette or tagliolini – but any shape will do), drain, open the jar, pour the content of the jar on the pasta and mix. If you are able to turn on the burners on your stove, you have no excuses. You can serve a beautiful plate of pasta, feel proud and make four people very happy. PS If you want to get fancy and emulate the Genovesi, after you put the pasta in the pot and the water starts boiling again, add string beans and potatoe cubes. The starch from the potatoes and the crunchiness of the string beans add a great texture to the dish and makes it sublime. I strongly suggest the potato cubes and string beans addition; sublime indeed! Another inspiring note from Martina. Folow thr traditions of Pesto and use trofie of you can find it – always with potato (waxy variety please) and tiny pieces of haricot beans can only increase your pleasure 1000 fold. Pesto is big in England and all on sale is pasteurised – so how can that be Pesto All Genovese I ask? If anyone is lucky enough to visit Camoli (30 mins from Genova on the little coastal train) eat pesto in the tiny restaurants above the town – follow the track up to the church and it’ll be obvious where to go. Ah pesto – can life get better? (well yes, truffles follow next month…………). ciao Gareth! so great to read you here. when you come to America, you should try our pesto. less charming, but also less expensive than a trip to Camogli! keep these lovely comments coming! we made our own just last month – an especially good year for basil in Pennsylvania and New Jersey! and we (3 of my four daughters and me) didn’t even get a ‘named’ variety – but my husband prepares the vegetable bed every spring with a big helping ‘hand’ from bags of manure, so perhaps that was something to do with it. in NJ it is much more humid and hot, 10 degrees cooler in the mountains – but both places did well. I shall be interested to see how it goes – and perhaps I should try your pesto to taste the difference – am going away tonight for a week, but will get back to you when I return. true, we had a good summer for basil. mine grew in a pot on my terrace and did very well. i cut a big bunch for Martina and she said it lasted for a long time fresh and fragrant. but the basil we have here is different than the one used for Pesto alla Genovese by Casa Lombardi. they use the basil from Pra, which has smaller leaves and a more delicate fragrance. try it when you get back and let us know. I’ m Stefano, I’m a new “purchase” of Gustiamo. I come from Genova the native land of Cristoforo Colombo..that discovered this fantastic continent the 12th october(next Monday!) 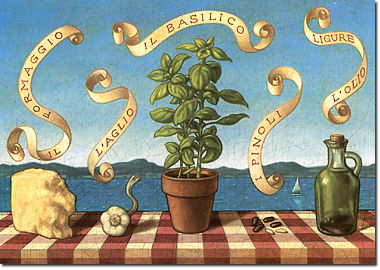 of some years ago….and, obviously, the native land of the Pesto. I have been eating pesto since I was born before from my granny and after from my Mom. I arrived in NYC only one week ago, for me it’s all incredible a little difficult…but Pesto save me!